Download Russian version of DreamBox SE F.A.Q. 1. Does DreamBox has to be activated? 2. How do I know the firmware version or serial number of my DreamBox? Download our software (DreamBox Service Software ) and install it. 3. Do I have to configure my USB ports for DreamBox usage? No. You should install drivers only. 4. How do I activate or update my DreamBox? Visit our website and choose DreamBox Firmware Update from Downloads section. 5. What do I do in case of box update problems? 6. Power indicator blinks red. What does it mean? It's means that some action wasn't finished successfully. 7. Can I use my DreamBox as a standalone device, or it has to be used with PC only? You can use DreamBox only with PC. 8. What software supports DreamBox interface and where to download it? DreamBox Service Software (DBSS). You can download it at our website www.dreambox.hk in Downloads section. 9. What flash file formats are supported by DreamBox and where do I find them? DreamBox Service Software (DBSS) supports all available formats of flash files for Sony Ericsson (*.ssw, *.mbn, *.fbn, *.dtf formats and customization packs in *.dta and *.zip formats) and Siemens phones (*.bin, WinSwup tools & Update tools *.exe, *.dtf and *.xfs formats). Flash files created by DreamBox developers are available at DREAMBOX section of www.boot-loader.com. 10. Does DreamBox Update requires using of any specific web browser? DreamBox updates performed directly form DBSS. No specific browsers or clients are required in this case. For more information please check the update manual. 11. I can't unlock E-Gold phones via testpoint, what is the problem? 12. I have performed the TestPoint procedure for Sony Ericsson handset. Do I need to perform the TP connection again for that specific phone? The TestPoint access mode has to be performed when the phone is connected for the first time. All future connections for the same phone have to be performed using "Security Bypass" access mode. 13. How to upgrade DreamBox Plus to DreamBox SE? In order to get DreamBox Plus upgraded to the DreamBox SE please enter the activation code to the DBSS and within one hour perform box firmware update process. For more information please check How To section. 14. Executing of "Security Bypass" operations failed at the Stage 2. Do I have to repeat the process from the beginning? It may happen that during the "Stage 2" of executing “"Security Bypass" the operation fails to complete. In this case please repeat the process for the "Stage 2" only. Unmark the option "Stage 1" and perform the process again. 15. At the moment in the GSM market there are 2 DreamBox hardware types: the old and the new. How can a user define the hardware type of his DB? It is pretty simple. Please take a look at the device’s USB connector: connector Type А indicates the older version, while connector Type В – the new one. 16. What is the functional difference between the DB with the new hardware type and the old one? 17. Which advantages are offered with the new hardware type? To enable the program to work automatically, the user should tick the Testpoint Autostart option of the Sony Ericsson tab in program settings or Autostart option in TP dialog box (Figure 3). Working with the new hardware type, the user just has to touch the corresponding TP on the flash memory chip. The connection of the needle with the TP launches the automated detection procedure, indicated by audio signal and TP connection indicator becoming green (Figure.3). Then it is important to hold the stable connection between the needle and the TP (usually for 3-5 sec), untill the software informs with a short audio signal (beep) and a message in the dialog box allowing to remove the needle from the TP. 18. How to choose the right TP schematic among the numerous variants? Define which type of the flash memory chip is on the PCB, as there are three types of DB2020 platform chips: Intel_5060M0Y0B0, Intel_5060M0Y0BE, and ST_M39P0R907. Define which type of substrate is under this flash memory chip (every type of the flash memory chip mentioned above has two types of substrate produced by different factories); in order to do this the user has to compare the TP pictures with the chip appearance using a microscope. Select the indicated substrate lead and touch it with the needle according to the DBSS instructions. It is also preferable to upgrade the TP adapter by replacing the standard needle (default solution) with a thinner one, e.g., beadwork needle. For hard-to-access TPs (e.g., in W710 or Z710 models) please, use a special TP needle with a bent end. Such a needle is absolutely necessary when the chip is tightly adjacent to the protective shield that must not be removed, or there is a component located very closely to the chip and therefore may be damaged with a straight needle. 19. What will happen if I mistakenly touch the wrong TP? In this situation neither the phone nor the DB are in danger, except for the cases when the user touches simultaneously the TP and a component (meaning the mounting lead of the component), responsible for power supply in the phone (capacitor, resistor etc.). This way the TP, i.e. the flash memory chip, may be shorted or exposed to a voltage surge. In the latter case the chip, phone’s processor or the shorted component may get burnt. 20. Why the TP connection indicator is always green? Most probably, the TP connect sensitivity is set to 100%. Sensitivity slider should be placed at around 70-80%, the optimum position is 70% (Figure 4). Also, such a failure may be caused by a defective or damaged TP-adapter v. 2.0 (i.e. TP- adapters with logic control inside). To solve the problem, the user should disassemble TP-adapter and make sure that PCB components are properly mounted; it is desirable to solder these components once more, paying special attention to U1 component (Figure 5). 21. Why does the program show TP connection error ? The user has selected the wrong TP schematic. Mistakenly defined type of the chip substrate because the substrate leads got oxidized. A TP needle is too thick, so it touches the adjacent components or the ground (protective shield). Besides, such problem may be caused by the previous modification of the TP adapter: a 150 pF capacitor soldered into the TP-adapter to stabilize operation with the E-Gold platform may cause equipment errors while working with SonyEricsson models. Therefore, we recommend to remove the capacitor mentioned above (Note: the TP-adapter will not work properly with Siemens E-Gold models after removal of the capacitor). 22. What is the normal duration of the TP1 and TP2 process? When you have touched the proper TP and the DBSS message prompts you to remove the needle, TP1 should finish within 7-10 sec. and TP2 – within 20-30 sec. If the process lasts too long – the only explanation is that the TP schematic was not selected properly or there are other problems (for details see Answer 21). 23. Is it necessary to repeat the TP1 after the TP2 finished with error? No, it is not necessary if you have not disconnected the cable from the phone and have not powered the handset off. 24. If the SecurityBypass procedure has been already performed in a phone, should it be repeated once more for this specific handset? No, there is no need to do this as the Security area of a certain phone remains accessible even after flashing this phone with full flash file from either the same or another handset. 25. Is it necessary to flash the phone with the GDFS file backed up from another handset of the same model in order to restore it? It is necessary only if the phone was previously flashed with the GDFS file, backed up from the handset of a different model (e.g., GDFS from К610 was flashed into К800 phone). If the phone was just blocked «with five locks», the GDFS can be restored without writing the GDFS file from another phone. 26. What is Unlock & Repair GDFS sec. Blocks option meant for? GDFS recalculation in the phone locked for 5 locks. GDFS recalculation after processor replacing (either with the brand new processor or with the component taken from a "donor" handset). Direct unlock of the phone. 27. Why does the process hangs at 25% and shows Error when I try to turn the phone into the boot mode? It is obvious that phone's hardware is damaged. Most probably flash memory chip or processor are defective; the other reason may be cold solder joints under the components as a result of falling down or other damages. 28. Can the cable for another similar device be used with the DreamBox? 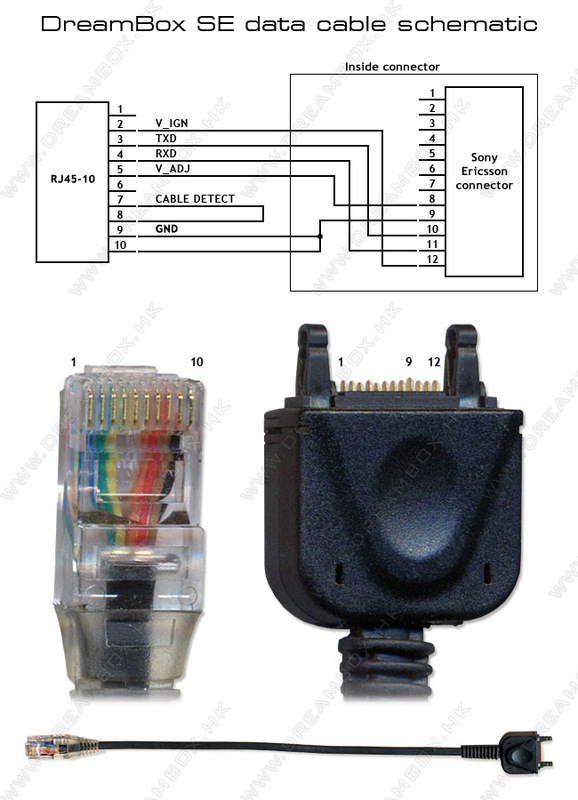 No, it cannot; SE cable schematic (pinout) is located at the product’s official site. 29. How should I work with the DB that does not support autodetect option and shows Error when the Start button is pressed? This problem happens because of unstable contact of TP-adapter needle with the TP. During the TP procedure it is important to hold the TP-adapter needle in contact with the TP WITHOUT BREAKAGE until the message: "Now the testpoint may be disconnected" is displayed. If you fail to perform this, an Error will appear. It is worth to remember another important thing: TP1 contact should be hold without breakage for 1-2 sec. and the TP2 – for 2-4 sec. 30. After flashing with a Full Flash file, the phone is still not operating. What should I do? Perform Unlock & Repair GDFS sec. Blocks procedure in Security Bypass mode. Write Fota + Main + FS + Cust.Pac into the phone. 31. While connecting via TP, the software allows to remove the TP and hangs. Why does it happen? This type of errors is caused by the previous modification of the TP-adapter for operation with Siemens E-Gold platform – a 150 pF capacitor was soldered into the needle holding shell of the TP-adapter to stabilize operation with this platform. However, in this case the capacitor is an obstruction of proper operation by causing such errors. Thus, the problem can be solved by removing of the above mentioned capacitor, but after such an upgrade the DB operation with E-Gold platform will become unstable. 32. Why does W200 unlock process via TestPoint sometimes hangs at TP №1? Insert the SIM card of the locking service provider into the phone and turn it on. Reset all phone settings through the menu. Replace the default theme for another theme and/or create a new contact in the phone book. After these operations, please, repeat the Security Bypass procedure in TestPoint mode. 33. How to correct the error? Hint: Now the probe might be disconnected appears in the dialogue box. The other cause resulting in such a failure is the unstable contact of the TP needle with the TP (connection failed). 34. How to repair GDFS? Select the required model from the list. Choose Test Point access mode. If the Security Bypass procedure was previously performed with this phone, please refer to the Step 5. Log to the Security tab. Choose Security Bypass access mode. If the phone's malfunction is caused by an unknown reason, it is recommended to flash the handset with the Full Flash file. Otherwise, if it's clearly defined that the GDFS zone is corrupted, please flash the phone with the GDFS file. Perform "Unlock And Repair GDFS Security Blocks" (Misc. tab). Flash the phone with the Main + FS + Custpac flash files. Hardware failure as a consequence of dropping, fluid damage, factory defect. Wrong model selected. There is a possibility that the PCB doesn’t correspond to the model indicated on the housing of the phone (a housing of K800 contains a K790 PCB, a W580 housing – contains a S500 PCB etc).